Helicobacter pylori infection and gastro-oesophageal reflux disease (GERD) account for most upper gastrointestinal pathologies with a wide spectrum of clinical manifestations. The interplay of both conditions is complex, in part intriguing, and has become a matter of debate because of conflicting results. The cardia is an area where both H pylori and abnormal GERD exert their damaging potential, inducing inflammation and its consequences, such as intestinal metaplasia. While the role of intestinal metaplasia within columnar lined epithelium (Barrett’s oesophagus) in the context of GERD is well established as a risk for neoplasia development, the role of intestinal metaplasia at the cardia in the context of H pylori infection is unclear. A particular challenge is the distinction of intestinal metaplasia as a consequence of GERD or H pylori if both conditions are concomitant. Available data on this issue, including follow up of a small patient series, are presented, but more studies are required to shed light on this issue because they will help to identify those patients that need surveillance. There is an area, the cardia, where both the abnormal gastro-oesophageal reflux and H pylori may potentially exert their damage independently. However, they may be concomitant and interfere with each other. The result of H pylori infection and GERD at the cardia is an inflammatory reaction. In a subset of patients the inflammation may progress and lead to intestinal metaplasia. In the following we will report on the complexity of the relationship between H pylori and GERD; the independent pathway of H pylori in the induction of inflammation and intestinal metaplasia, with special focus on the cardia; and the abnormalities of the oesophago–gastric junction (OGJ) in association with GERD. Further aspects are the characterisation of the intestinal metaplasia and the question of whether a distinction of intestinal metaplasia types will be attributed to either H pylori or GERD, and, finally, the fate of intestinal metaplasia during follow up. Studies from Japan in patients with atrophic gastritis reported increased acid production following H pylori eradication and induction of GERD in a subset of patients.24,25 These patients were, however, predisposed because of a pre-existing impaired anti-reflux barrier.24,25 On the contrary, studies from Europe found that H pylori eradication did not lead to alterations in the duodenogastro-oesophageal reflux pattern26 and the H pylori status in patients with GERD did not impact on the degree of oesophageal acid exposure.22,27 From these pathophysiological considerations the risk for GERD development following eradication seems to be low and is, if at all, restricted to patients with atrophic gastritis in whom acid secretion recovers and meets with the premise of an abnormal gastro-oesophageal reflux barrier. In conclusion, we appreciate the clinical reality that there is a large population of patients with GERD and concomitant H pylori infection. There is inconclusive evidence that more severe forms of GERD have a lower prevalence of H pylori infection or are infected with less virulent strains. From all current debates concerning the clinical management of H pylori infection in patients with GERD, eradication treatment is recommended in those who require long term PPI.39 In most recent studies relapses of GERD are not more frequent in those treated for H pylori infection.40–42 However, in a further study, healing failure was more frequent in patients with H pylori eradication. Relapses in those patients with GERD on low dose PPI maintenance have also been reported to be more frequent following H pylori eradication.23 Both PPI doses for initial healing (omeprazole 20 mg) and for maintenance (omeprazole 10 mg) do not correspond to current PPI standard dosing requirements. Once intestinal metaplasia is established, H pylori is no longer capable of colonising this epithelium. However, because intestinal metaplasia is often a focal process, H pylori may survive on the gastric epithelium in the neighbourhood of intestinal metaplasia. GERD is associated with a wide spectrum of endoscopic and histopathological changes. From the endoscopic perspective, GERD presents as non-erosive reflux disease (NERD), erosive reflux disease (ERD), or as columnar lined oesophagus (CLE). A recent validated classification distinguishes between NERD and ERD of different severity degrees.59 Histologically, CLE may contain three different types of mucosa: specialised intestinal metaplasia, cardiac type mucosa, or oxyntic mucosa.60 Where the term Barrett’s oesophagus has formerly been used for any CLE irrespective of histology, there is now general acceptance that Barrett’s oesophagus designates CLE containing specialised intestinal metaplasia.61 Although the determinants of the multifactorial aetiology of Barrett’s oesophagus are not completely elucidated, gastro-oesophageal reflux is agreed upon as a necessary condition and as the most important causal factor. With the appropriate consideration of pitfalls such as hiatal hernia and erosive inflammatory lesions, the length of CLE segments is considered as short if <3 cm and long if >3 cm. As CLE may contain gastric type epithelium, it is not surprising that CLE may be colonised by H pylori. The rate of colonisation in patients with an infected stomach varies considerably among different studies, ranging 0–90%.6 When considering the different types of epithelium within CLE, it becomes clear that only gastric type metaplasia, not specialised intestinal metaplasia, can be colonised by the bacterium. It is unknown whether such colonisation may increase the risk of carcinoma within CLE. Prevalence of intestinal metaplasia dependent on endoscopic appearance of oesophagogastric junction. The risk of intestinal metaplasia detected at the cardia with an endoscopically normal OGJ for adenocarcinoma is presently unknown. It may be close to the high risk of Barrett’s oesophagus 10- to 30-fold,62 or to the much lower risk of intestinal metaplasia in the stomach, which amounts to a factor of two to threefold.58 As long as longitudinal data on this topic are scarce, the estimation of the risk is essentially based on extrapolations from clinical, endoscopic, and histological associations with intestinal metaplasia at the cardia. The association of intestinal metaplasia is less frequent with GERD manifestations than the correlation to H pylori infection and intestinal metaplasia in the gastric antrum. Why this discrepancy? The main reason for it is the difference at the biopsy site. Almost all studies showing an association of intestinal metaplasia with GERD manifestations included cases with a maximum of 2 cm columnar lining in the lower oesophagus. Therefore, these studies in part investigated patients who would be classified nowadays as short segment Barrett’s oesophagus rather than intestinal metaplasia at the normal OGJ.69,73,77,81 The authors of all these studies report the patient characteristics independent of length of columnar lining and also independent of any endoscopic irregularities of the Z-line. In contrast, the vast majority of studies that excluded patients with any columnar lining in the lower oesophagus or patients with short segment Barrett’s oesophagus did not confirm an association with GERD manifestations. However, the majority of studies of an association of cardia intestinal metaplasia with intestinal metaplasia in the distal stomach and of H pylori infection targeted the biopsies precisely to the OGJ, defined as the proximal end of the gastric folds. Biopsies have been reported to contain squamous as well as columnar epithelium. Four studies even focused only on biopsies containing cardiac type mucosa.54,67,70,81 Biopsies taken according to these criteria will more reliably stem from the gastric cardia than biopsies obtained from 1–2 cm below the OGJ, and allow a more precise allocation of intestinal metaplasia to the cardia. The evidence from these studies is that intestinal metaplasia at the endoscopically normal OGJ is associated with intestinal metaplasia in the distal stomach and a consequence of H pylori infection, and less likely a consequence of an abnormal acid reflux (GERD). The challenge in the individual case remains whether intestinal metaplasia at the cardia is the expression of an abnormal gastric reflux condition or is due to H pylori in those cases in which both conditions coexist. Several histochemical and immunohistochemical methods have been proposed for the assignment of intestinal metaplasia at the cardia to either Barrett’s oesophagus or gastric intestinal metaplasia. The most promising approaches are mucin staining and immunohistochemistry with antibodies against cytokeratin (CK) and colonic antigens. Regarding CKs, Ormsby et al93 observed three distinct patterns of CK7 and CK20: Barrett type characterised by strong diffuse CK7 and superficial CK20 immmunostaining; gastric type with complete intestinal metaplasia characterised by absence of CK7 and strong diffuse CK20 staining; and gastric type with incomplete intestinal metaplasia showing weak patchy CK7 staining and moderate patchy CK20 staining. The reasonably good correlation with clinical and endoscopic characteristics of such systematic staining has been confirmed by Coulevard et al,94 Wallner et al,86 Jovanovic et al,95 and Glickman et al,96 whereas Mohammed et al97 and El-Zimaitiy and Graham98 did not find the CK pattern sufficiently helpful for differentiation. There are no data yet on the relevance of CK pattern for the prognosis regarding potential development towards neoplasia. The real nature of cardia intestinal metaplasia and its variant endoscopic and histological appearances will not be disclosed until sufficient longitudinal study data are available. 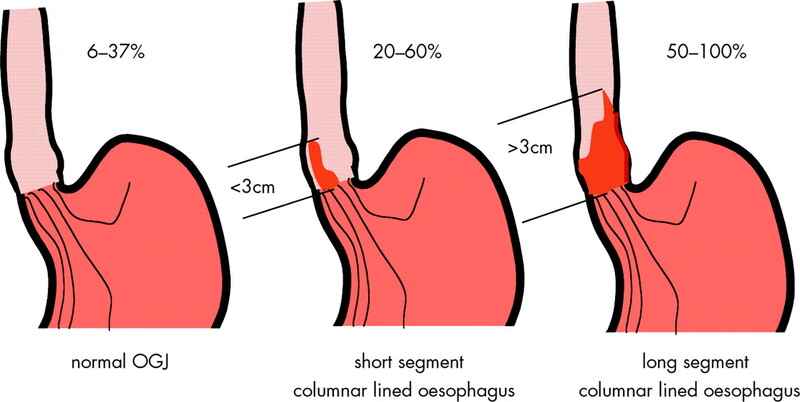 The development of Barrett’s oesophagus starts at or close to the OGJ. Hence, intestinal metaplasia at the cardia may represent the beginning of Barrett’s oesophagus. It is well known that the extent of Barrett’s oesophagus develops rapidly and then remains rather stable for many years.100 Therefore, those cases with cardia intestinal metaplasia that represent the beginning of Barrett’s oesophagus would be identified during follow up examinations. Several explanations may account for such diverging results. One is therapeutic intervention. In one of the studies reporting a decreased prevalence of intestinal metaplasia at follow up, patients are examined after fundoplication. In our study, all patients with H pylori infection received eradication therapy and subsequently PPI treatment on demand. Other studies did not provide data on treatment during the interval until follow up. Never the less, the rather low rate of persistence of intestinal metaplasia in the cardia, around 50%, is a surprising result. The available data, however, are too scarce to state that intestinal metaplasia at the cardia is really reversible. It still has to be excluded that disappearance of cardia intestinal metaplasia is not just a biopsy sampling error as intestinal metaplasia is known to be distributed in a patchy and mosaic pattern.105,106 Such distribution is known for both gastric intestinal metaplasia as well as specialised intestinal metaplasia in the oesophagus. The occurrence of dysplasia (nowadays designated as intraepithelial neoplasia) within cardia intestinal metaplasia has been reported only by one group in one patient after a median follow up interval of approximately 2 years.102–109 Certainly, the number of patients observed as yet is too small to draw any conclusions. But by extrapolating data derived from cross sectional studies, we may conclude that the risk for neoplasia is lower than for Barrett’s oesophagus.68 Whether it is as low as the risk of gastric intestinal metaplasia to be associated with gastric cancer (two to threefold58) needs to be determined. Blaser MJ. Hypothesis: the changing relationships of Helicobacter pylori and humans: implications for health and disease. J Infect Dis1999;179:1523–30. Bardhan KD, Royston C, Nayyar M, et al. Reflux rising! A disease in evolution. Gastroenterology2004;118 (Suppl 2pt1) :A478. El Serag HB, Sonnenberg A. Opposing time trends of peptic ulcer and reflux disease. Gut1998;43:327–33. Devesa SS, Blot WJ, Fraumeni JFJ. Changing patterns in the incidence of esophageal and gastric carcinoma in the United States. Cancer1998;83:2049–53. O’Connor HJ. Helicobacter pylori and gastro-oesophageal reflux disease-clinical implications and management [Review]. Aliment Pharmacol Ther1999;13:117–27. Labenz J , Blum AL, Bayerdorffer E, et al. Curing Helicobacter pylori infection in patients with duodenal ulcer may provoke reflux esophagitis. Gastroenterology1997;112:1442–7. Malfertheiner P , Gerards C. Helicobacter pylori infection and gastro-oesophageal reflux disease: coincidence or association? Baillieres Best Pract Res Clin Gastroenterol2000;14:731–41. Xia HH, Talley NJ. Helicobacter pylori infection, reflux esophagitis, and atrophic gastritis: an unexplored triangle. Am J Gastroenterol1998;93:394–400. Sharma P , Vakil N. Helicobacter pylori and reflux disease [Review]. Aliment Pharmacol Ther2003;17:297–305. Labenz J , Malfertheiner P. Helicobacter pylori in gastro-oesophageal reflux disease: causal agent, independent or protective factor? Gut1997;41:277–80. Calam J , Gibbons A, Healey ZV, et al. How does Helicobacter pylori cause mucosal damage? Its effect on acid and gastrin physiology. Gastroenterology1997;113 (Suppl) :S43–9. el Omar EM, Oien K, El Nujumi A, et al. Helicobacter pylori infection and chronic gastric acid hyposecretion. Gastroenterology1997;113:15–24. Gillen D , el Omar EM, Wirz AA, et al. The acid response to gastrin distinguishes duodenal ulcer patients from Helicobacter pylori-infected healthy subjects. Gastroenterology1998;114:50–7. Koike T , Ohara S, Sekine H, et al. Helicobacter pylori infection prevents erosive reflux oesophagitis by decreasing gastric acid secretion. Gut2001;49:330–4. Yamaji Y , Mitsushima T, Ikuma H, et al. Inverse background of Helicobacter pylori antibody and pepsinogen in reflux oesophagitis compared with gastric cancer: analysis of 5732 Japanese subjects. Gut2001;49:335–40. El Serag HB, Sonnenberg A, Jamal MM, et al. Corpus gastritis is protective against reflux oesophagitis. Gut1999;45:181–5. Genta RM, Graham DY. Comparison of biopsy sites for the histopathologic diagnosis of Helicobacter pylori: a topographic study of H pylori density and distribution. Gastrointest Endosc1994;40:342–5. Khulusi S , Mendall MA, Patel P, et al. Helicobacter pylori infection density and gastric inflammation in duodenal ulcer and non-ulcer subjects. Gut1995;37:319–24. Robert ME, Weinstein WM. Helicobacter pylori-associated gastric pathology. Gastroenterol Clin North Am1993;22:59–72. Schultze V , Hackelsberger A, Gunther T, et al. Differing patterns of Helicobacter pylori gastritis in patients with duodenal, prepyloric, and gastric ulcer disease. Scand J Gastroenterol1998;33:137–42. Zentilin P , Iiritano E, Vignale C, et al. Helicobacter pylori infection is not involved in the pathogenesis of either erosive or non-erosive gastro-oesophageal reflux disease. Aliment Pharmacol Ther2003;17:1057–64. Wu JC, Chan FK, Ching JY, et al. Effect of Helicobacter pylori eradication on treatment of gastro-oesophageal reflux disease: a double blind, placebo controlled, randomised trial. Gut2004;53:174–9. Haruma K , Mihara M, Okamoto E, et al. Eradication of Helicobacter pylori increases gastric acidity in patients with atrophic gastritis of the corpus-evaluation of 24-h pH monitoring. Aliment Pharmacol Ther1999;13:155–62. Koike T , Ohara S, Sekine H, et al. Increased gastric acid secretion after Helicobacter pylori eradication may be a factor for developing reflux oesophagitis. Aliment Pharmacol Ther2001;15:813–20. Manifold DK, Anggiansah A, Rowe I, et al. Gastro-oesophageal reflux and duodenogastric reflux before and after eradication in Helicobacter pylori gastritis. Eur J Gastroenterol Hepatol2001;13:535–9. Peters FT, Kuipers EJ, Ganesh S, et al. The influence of Helicobacter pylori on oesophageal acid exposure in GERD during acid suppressive therapy. Aliment Pharmacol Ther1999;13:921–6. Chow WH, Blaser MJ, Blot WJ, et al. An inverse relation between cagA+ strains of Helicobacter pylori infection and risk of esophageal and gastric cardia adenocarcinoma. Cancer Res1998;58:588–90. Vaezi MF, Falk GW, Peek RM, et al. CagA-positive strains of Helicobacter pylori may protect against Barrett’s esophagus. Am J Gastroenterol2000;95:2206–11. Vicari JJ, Peek RM, Falk GW, et al. The seroprevalence of cagA-positive Helicobacter pylori strains in the spectrum of gastroesophageal reflux disease. Gastroenterology1998;115:50–7. Wu AH, Crabtree JE, Bernstein L, et al. Role of Helicobacter pylori CagA+ strains and risk of adenocarcinoma of the stomach and esophagus. Int J Cancer2003;103:815–21. Arents NL, van Zwet AA, Thijs JC, et al. The importance of vacA, cagA, and iceA genotypes of Helicobacter pylori infection in peptic ulcer disease and gastroesophageal reflux disease. Am J Gastroenterol2001;96:2603–8. Fallone CA, Barkun AN, Gottke MU, et al. Association of Helicobacter pylori genotype with gastroesophageal reflux disease and other upper gastrointestinal diseases. Am J Gastroenterol2000;95:659–69. Leodolter A , Wolle K, Peitz U, et al. Helicobacter pylori genotypes and expression of gastritis in erosive gastro-oesophageal reflux disease. Scand J Gastroenterol2003;38:498–502. Fallone CA, Barkun AN, Friedman G, et al. Is Helicobacter pylori eradication associated with gastroesophageal reflux disease? Am J Gastroenterol2000;95:914–20. Laine L , Sugg J. Effect of Helicobacter pylori eradication on development of erosive esophagitis and gastroesophageal reflux disease symptoms: a post hoc analysis of eight double blind prospective studies. Am J Gastroenterol2002;97:2992–7. Malfertheiner P , Dent J, Zeijlon L, et al. Impact of Helicobacter pylori eradication on heartburn in patients with gastric or duodenal ulcer disease—results from a randomized trial programme. Aliment Pharmacol Ther2002;16:1431–42. Holtmann G , Cain C, Malfertheiner P. Gastric Helicobacter pylori infection accelerates healing of reflux esophagitis during treatment with the proton pump inhibitor pantoprazole. Gastroenterology1999;117:11–6. Malfertheiner P , Megraud F, ÓMorain C, et al. Current concepts in the management of Hleicobacter pylori infection—The Maastricht 2-2000 Consensus report. Aliment Pharmacol Ther2002;16:167–80. Moayyedi P , Bardhan C, Young L, et al. Helicobacter pylori eradication does not exacerbate reflux symptoms in gastroesophageal reflux disease. Gastroenterology2001;121:1120–6. Schwizer W , Thumshirn M, Dent J, et al. Helicobacter pylori and symptomatic relapse of gastro-oesophageal reflux disease: a randomised controlled trial. Lancet2001;357:1738–42. Kuipers EJ, Nelis GF, Klinkenberg-Knol EC, et al. Cure of Helicobacter pylori infection in patients with reflux oesophagitis treated with long term omeprazole reverses gastritis without exacerbation of reflux disease: results of a randomised controlled trial. Gut2004;53:12–20. Genta RM, Huberman RM, Graham DY. The gastric cardia in Helicobacter pylori infection. Hum Pathol1994;25:915–9. Hackelsberger A , Gunther T, Schultze V, et al. Prevalence and pattern of Helicobacter pylori gastritis in the gastric cardia. Am J Gastroenterol1997;92:2220–4. Voutilainen M , Farkkila M, Mecklin JP, et al. Chronic inflammation at the gastroesophageal junction (carditis) appears to be a specific finding related to Helicobacter pylori infection and gastroesophageal reflux disease. The Central Finland Endoscopy Study Group. Am J Gastroenterol1999;94:3175–80. Chen YY, Antonioli DA, Spechler SJ, et al. Gastroesophageal reflux disease versus Helicobacter pylori infection as the cause of gastric carditis. Mod Pathol1998;11:950–6. Goldblum JR, Richter JE, Vaezi M, et al. Helicobacter pylori infection, not gastroesophageal reflux, is the major cause of inflammation and intestinal metaplasia of gastric cardiac mucosa. Am J Gastroenterol2002;97:302–11. Goldstein NS, Karim R. Gastric cardia inflammation and intestinal metaplasia: associations with reflux esophagitis and Helicobacter pylori. Mod Pathol1999;12:1017–24. Wieczorek TJ, Wang HH, Antonioli DA, et al. Pathologic features of reflux and Helicobacter pylori-associated carditis: a comparative study. Am J Surg Pathol2003;27:960–8. Hackelsberger A , Gunther T, Schultze V, et al. Intestinal metaplasia at the gastro-oesophageal junction: Helicobacter pylori gastritis or gastro-oesophageal reflux disease? Gut1998;43:17–21. Voutilainen M , Farkkila M, Juhola M, et al. Complete and incomplete intestinal metaplasia at the oesophagogastric junction: prevalences and associations with endoscopic erosive oesophagitis and gastritis. Gut1999;45:644–8. Hackelsberger A , Schultze V, Gunther T, et al. The prevalence of Helicobacter pylori gastritis in patients with reflux oesophagitis: a case-control study. Eur J Gastroenterol Hepatol1998;10:465–8. Oberg S , Peters JH, DeMeester TR, et al. Inflammation and specialized intestinal metaplasia of cardiac mucosa is a manifestation of gastroesophageal reflux disease. Ann Surg1997;226:522–30. Oksanen A , Sipponen P, Karttunen R, et al. Inflammation and intestinal metaplasia at the squamocolumnar junction in young patients with or without Helicobacter pylori infection. Gut2003;52:194–8. Dixon MF. Histological responses to Helicobacter pylori infection: gastritis, atrophy and preneoplasia. Baillieres Clin Gastroenterol1995;9:467–86. Dixon MF. Prospects for intervention in gastric carcinogenesis: reversibility of gastric atrophy and intestinal metaplasia. Gut2001;49:2–4. Meining A , Kiel G, Stolte M. Changes in Helicobacter pylori-induced gastritis in the antrum and corpus during and after 12 months of treatment with ranitidine and lansoprazole in patients with duodenal ulcer disease. Aliment Pharmacol Ther1998;12:735–40. Lundell LR, Dent J, Bennett JR, et al. Endoscopic assessment of oesophagitis: clinical and functional correlates and further validation of the Los Angeles classification. Gut1999;45:172–80. Chandrasoma PT, Der R, Dalton P, et al. Distribution and significance of epithelial types in columnar-lined esophagus. Am J Surg Pathol2001;25:1188–93. Sampliner RE, Camargo L, Fass R. Impact of esophageal acid exposure on the endoscopic reversal of Barrett’s esophagus. Am J Gastroenterol2002;97:270–2. Malfertheiner P , Lind T, Willich S, et al. Prognostic influence of Barrett’s esophagus and of H Pylori infection on healing of erosive GERD and symptom resolution in non-erosive GERD. Gut2005;54 (Suppl 1) :i27–32. Sharma P , Sidorenko EI. Are screening and surveillance for Barrett’s oesophagus really worthwhile? Gut2005;54 (Suppl 1) :i27–32. Carton E , Mulligan ED, Keeling PW, et al. Specialized intestinal metaplasia: analysis of prevalence, risk factors and association with gastro-oesophageal reflux disease. Br J Surg2000;87:362–73. Dincer D , Besisik F, Sahin E, et al. Intestinal metaplasia of the gastric cardia: a study from Turkey. Hepatogastroenterology2002;49:1153–6. El Zimaity HM, Verghese VJ, Ramchatesingh J, et al. The gastric cardia in gastro-oesophageal disease. J Clin Pathol2000;53:619–25. Hirota WK, Loughney TM, Lazas DJ, et al. Specialized intestinal metaplasia, dysplasia, and cancer of the esophagus and esophagogastric junction: prevalence and clinical data. Gastroenterology1999;116:277–85. Johnston MH, Hammond AS, Laskin W, et al. The prevalence and clinical characteristics of short segments of specialized intestinal metaplasia in the distal esophagus on routine endoscopy. Am J Gastroenterol1996;91:1507–11. Law S , Lam KY, Chu KM, et al. Specialized intestinal metaplasia and carditis at the gastroesophageal junction in Chinese patients undergoing endoscopy. Am J Gastroenterol2002;97:1924–9. Morales TG, Bhattacharyya A, Johnson C, et al. Is Barrett’s esophagus associated with intestinal metaplasia of the gastric cardia? Am J Gastroenterol1997;92:1818–22. Morini S , Zullo A, Hassan C, et al. Gastric cardia inflammation: role of Helicobacter pylori infection and symptoms of gastroesophageal reflux disease. Am J Gastroenterol2001;96:2337–40. Nandurkar S , Talley NJ, Martin CJ, et al. Short segment Barrett’s oesophagus: prevalence, diagnosis and associations. Gut1997;40:710–5. Ormsby AH, Kilgore SP, Goldblum JR, et al. The location and frequency of intestinal metaplasia at the esophagogastric junction in 223 consecutive autopsies: implications for patient treatment and preventive strategies in Barrett’s esophagus. Mod Pathol2000;13:614–20. Peck-Radosavljevic M , Puspok A, Potzi R, et al. Histological findings after routine biopsy at the gastro-oesophageal junction. Eur J Gastroenterol Hepatol1999;11:1265–70. Pieramico O , Zanetti MV. Relationship between intestinal metaplasia of the gastro-oesophageal junction, Helicobacter pylori infection and gastro-oesophageal reflux disease: a prospective study. Dig Liver Dis2000;32:567–72. Spechler SJ, Zeroogian JM, Antonioli DA, et al. Prevalence of metaplasia at the gastro-oesophageal junction. Lancet1994;344:1533–6. Trudgill NJ, Suvarna SK, Kapur KC, et al. Intestinal metaplasia at the squamocolumnar junction in patients attending for diagnostic gastroscopy. Gut1997;41:585–9. Wolf C , Seldenrijk CA, Timmer R, et al. Epidemiological, clinical, and histological characteristics of intestinal metaplasia at the oesophagogastric junction compared to short segments of columnar-lined oesophagus. Eur J Gastroenterol Hepatol2001;13:113–20. El Serag HB, Sonnenberg A, Jamal MM, et al. Characteristics of intestinal metaplasia in the gastric cardia. Am J Gastroenterol1999;94:622–7. Carton E , Caldwell MT, McDonald G, et al. Specialized intestinal metaplasia in patients with gastro-oesophageal reflux disease. Br J Surg2000;87:116–21. Chalasani N , Wo JM, Hunter JG, et al. Significance of intestinal metaplasia in different areas of esophagus including esophagogastric junction. Dig Dis Sci1997;42:603–7. Csendes A , Smok G, Flores N, et al. Comparison of clinical, endoscopic and functional findings in patients with intestinal metaplasia at the cardia, carditis and short-segment columnar epithelium of the distal esophagus with and without intestinal metaplasia. Dis Esophagus2000;13:61–8. Pereira AD, Suspiro A, Chaves P, et al. Short segments of Barrett’s epithelium and intestinal metaplasia in normal appearing oesophagogastric junctions: the same or two different entities? Gut1998;42:659–62. Voutilainen M , Farkkila M, Mecklin JP, et al. Classical Barrett esophagus contrasted with Barrett-type epithelium at normal-appearing esophagogastric junction. Central Finland Endoscopy Study Group. Scand J Gastroenterol2000;35:2–9. Wallner B , Sylvan A, Janunger KG, et al. Immunohistochemical markers for Barrett’s esophagus and associations to esophageal Z-line appearance. Scand J Gastroenterol2001;36:910–5. Dixon MF, Mapstone NP, Neville PM, et al. Bile reflux gastritis and intestinal metaplasia at the cardia. Gut2002;51:351–5. Oberg S , Peters JH, DeMeester TR, et al. Determinants of intestinal metaplasia within the columnar-lined esophagus. Arch Surg2000;135:651–5. Jass JR, Filipe MI. The mucin profiles of normal gastric mucosa, intestinal metaplasia and its variants and gastric carcinoma. Histochem J1981;13:931–9. van Sandick JW, van Lanschot JB, van Felius L, et al. Intestinal metaplasia of the esophagus or esophagogastric junction: evidence of distinct clinical, pathologic, and histochemical staining features. Am J Clin Pathol2002;117:117–25. Byrne JP, Bhatnagar S, Hamid B, et al. Comparative study of intestinal metaplasia and mucin staining at the cardia and esophagogastric junction in 225 symptomatic patients presenting for diagnostic open-access gastroscopy. Am J Gastroenterol1999;94:98–103. Gunther T , Hackelsberger A, Malfertheiner P, et al. Is typing of metaplasia at the squamocolumnar junction revealing its aetiology? Virchows Arch2000;436:6–11. Ormsby AH, Goldblum JR, Rice TW, et al. The utility of cytokeratin subsets in distinguishing Barrett’s-related oesophageal adenocarcinoma from gastric adenocarcinoma. Histopathology2001;38:307–11. Couvelard A , Cauvin JM, Goldfain D, et al. Cytokeratin immunoreactivity of intestinal metaplasia at normal oesophagogastric junction indicates its aetiology. Gut2001;49:761–6. Jovanovic I , Tzardi M, Mouzas IA, et al. Changing pattern of cytokeratin 7 and 20 expression from normal epithelium to intestinal metaplasia of the gastric mucosa and gastroesophageal junction. Histol Histopathol2002;17:445–54. Mohammed IA, Streutker CJ, Riddell RH. Utilization of cytokeratins 7 and 20 does not differentiate between Barrett’s esophagus and gastric cardiac intestinal metaplasia. Mod Pathol2002;15:611–6. El Zimaity HM, Graham DY. Cytokeratin subsets for distinguishing Barrett’s esophagus from intestinal metaplasia in the cardia using endoscopic biopsy specimens. Am J Gastroenterol2001;96:1378–82. Falk GW. Barrett’s esophagus. Gastroenterology2002;122:1569–91. DeMeester SR, Campos GM, DeMeester TR, et al. The impact of an antireflux procedure on intestinal metaplasia of the cardia. Ann Surg1998;228:547–56. Sharma P , Weston AP, Morales T, et al. Relative risk of dysplasia for patients with intestinal metaplasia in the distal oesophagus and in the gastric cardia. Gut2000;46:9–13. Goldstein NS. Gastric cardia intestinal metaplasia: biopsy follow-up of 85 patients. Mod Pathol2000;13:1072–9. Jones TF, Sharma P, Daaboul B, et al. Yield of intestinal metaplasia in patients with suspected short-segment Barrett’s esophagus (SSBE) on repeat endoscopy. Dig Dis Sci2002;47:2108–11. Eloubeidi MA, Provenzale D. Does this patient have Barrett’s esophagus? The utility of predicting Barrett’s esophagus at the index endoscopy. Am J Gastroenterol1999;94:937–43. Fitzgerald RC, Abdalla S, Onwuegbusi BA, et al. Inflammatory gradient in Barrett’s oesophagus: implications for disease complications. Gut2002;51:316–22. Oberg S , Johansson J, Wenner J, et al. Endoscopic surveillance of columnar-lined esophagus: frequency of intestinal metaplasia detection and impact of antireflux surgery. Ann Surg2001;234:619–26. Padda S , Ramirez FC. Accuracy in the diagnosis of short-segment Barrett’s esophagus: the role of endoscopic experience. Gastrointest Endosc2001;54:605–8. Morales TG, Camargo E, Bhattacharyya A, et al. Long-term follow-up of intestinal metaplasia of the gastric cardia. Am J Gastroenterol2000;95:1677–80.